When you take First Aid classes in Ann Arbor from the experts at the American Red Cross, we can help you learn how to provide care when it's needed most. Training takes just a few short hours, and after successfully completing the class you'll receive a two-year certification. At the American Red Cross, our First Aid classes in Ann Arbor will help you learn how to care for yourself and others, including children, during an emergency. When you sign up for one of our in-person or blended Simulation Learning classes, you'll hear from knowledgeable instructors and have the opportunity to practice your skills in a real-world setting, and gain valuable feedback. Meanwhile, our online-only first-aid training gives you access to the same information, but in lieu of a skills session, you'll complete several activities that will help you test your decision-making skills and better understand what to do and when. 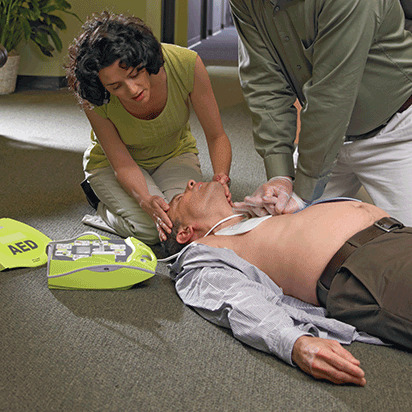 At the Red Cross, our CPR and First Aid training in Ann Arbor are combined into one course. This way you can gain the skills and information you need to provide care during breathing emergencies and other times of crisis. By learning how to perform CPR, staunch bleeding, help with muscle, bone and joint injuries, and more, you can capably, confidently provide care to a loved one or act as a Good Samaritan while waiting for medical professionals arrive. Find first aid classes in Ann Arbor that can help your school create a safer campus community. When you become part of the Red Cross Schools Program your teachers and administrators will not only receive first aid training from the American Red Cross, but they will also learn how to train their students for free. Find out how to join our program. When it comes to first aid, it's important to know how to treat both kids and adults. That's why, in our Ann Arbor first aid classes, we'll review the procedures for caring for adults separately from those that are applicable to kids. By doing so, our instructors make it easy to understand the differences when providing care so that you can help each person according to his or her needs. Because children and infants require special care during times of crisis, our first aid classes in Ann Arbor include detailed information on helping kids who are sick or injured. This way, you can provide children with the care they need in a way that won't cause further damage to their growing bodies. After your first aid training in Ann Arbor, it's important to keep the steps for providing care fresh in your memory. To help you remember the process correctly, we've developed a simple-to-review document that outlines the basics of first aid care. Look at them online anytime, or print them up and keep them in a binder, at your desk, or on your refrigerator, and refer to them anytime you need a quick refresher. At the Red Cross, we work to empower you with the most accurate, up-to-date information available. In order to ensure that you receive the best possible training, all of our courses and materials are developed under the guidance of, and reviewed by, the Red Cross Scientific Advisory Council. This means that whether you've signed up for first aid training in Ann Arbor, want to take the class online, or are traveling with a group to take the class in another city, you'll get the same accurate, proven information.